Quartz is an armchair designed by CTRL ZAK and Davide Barzaghi, the result of a mathematical series applied to furnishings. 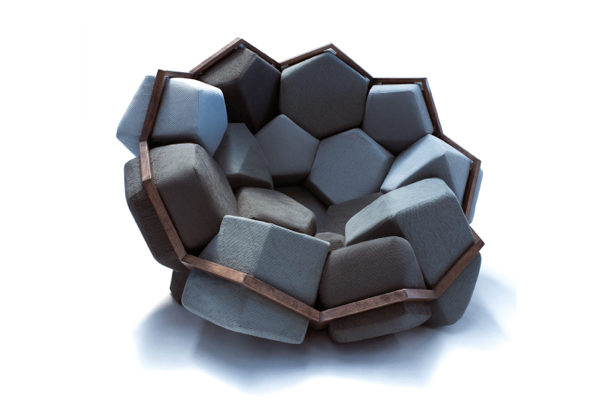 The two-dimensional structure in beechwood – pentagons and hexagons – develops three-dimensionally in space thanks to the volumising effect of the stuffing, upholstered with natural fibres. Thus, a comforting, wraparound micro-habitat is created in this grid enriched with geometric shapes. Quartz is a limited edition production, due to the exacting nature of its manufacture. Indeed, each of the “crystals” that create the seating is distinctive. The result is that each and every creation is unique and inimitable. The good news for you is that the chair is currently on sale for the bargain price of $14,000. You can see and learn more here.